Black holes are some of the strangest objects in the universe. But, just as impenetrable a mystery? The heavy cloud cover encircling some black holes. Now, for the first time, researchers say they’ve managed to get a glimpse inside of one of those clouds. And what they found has some serious implications for our most basic understanding of black holes. Some black holes are shielded by heavy clouds of gas and dust that are so thick that they’re impossible to see through with our telescopes. The reasons why have plagued scientists. But a brand new X-ray view taken by a joint team from NASA and the European Space Agency of galaxy NGC 1068, and the black hole that lies at its center, just changed all that. So what did scientists find when they peered deep into the cloud? Instead of being the constant, even haze that they expected, the cloud was actually made up of a series of heavy “clumps” of gas and dust wrapped tightly together. Besides telling us something about the clouds themselves, though, this finding might also shed some light on one of the most basic black hole mysteries: Why do some black holes not appear to have these clouds at all? One way scientists have long attempted to resolve that mystery is with a piece of black hole science called the “doughnut theory.” The “doughnut theory” suggests that one of the reasons some black holes are shielded by thick clouds isn’t because of actual differences between different black holes, it’s a difference in how we see them. Imagine, for a moment, a giant doughnut. If you are eye-level with that doughnut and looking at it from the side, all you will see is a wall of pastry. Now, imagine instead that this giant doughnut is on a table and you are above, looking down. Now the shape of the doughnut, and its features, are suddenly quite clear. According to the “doughnut theory,” black holes are like a box of giant, cosmic doughnuts flung all around us—some of these doughnuts we see mid-air at eye-level, some are high above our heads, and some have fallen to the ground so that we see only the tops. The “doughnut theory” has been a highly influential piece of black hole theory for decades now. Knowing that the composition of these clouds is not even, but lumpy, adds even more layers to the theory. 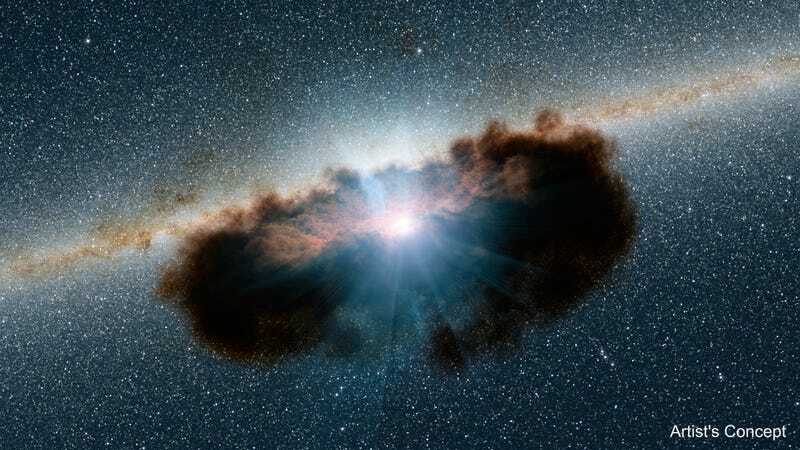 If the theory is correct, than these new results indicate that it is not simply a matter of shifting perspective that shows us all these different types of black holes—it could also be a sign of genuinely different cloud compositions in our view. The next step, researchers say, is figuring out why these clumps form and cluster together at all, adding on yet another black hole puzzle to be solved.